Get ready for a super splash or three! 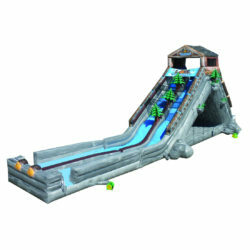 Have triple the slippin’ ‘n’ slidin’ party fun with the Triple Lindy Surf N Slide. This extra-long wet and wild water slide and pool attachment work perfectly with the Triple Lindy slide. Just remove the dry bumper and attach the Surf N Slide. Now you’ve got a huge triple water slide plus an extra long surf zone through three colorful arches ending in a large splash pool.